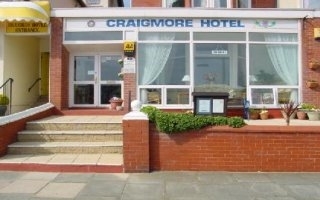 The Craigmore is a small family run hotel located adjacent to Blackpool's more select North Promenade. Our hotel is south facing and benefits from excellent views over Gynn Gardens, the sea and illuminations. From the Promenade travel North for 1 mil epast the tower. At the Roundabout take the first exit, then first right into Willshaw Road.